Sorry for my absence these many days...No i wasn't busy, but kind of lazy..YES LAZY..Today i took up all my laziness and throwed it away in garbage and decided to write in this blog.. Morning Breakfast : Maha's waking time started getting inregular, somedays she wakes up at 7.00 AM someday she get up to 9.00 AM. Whatever time she gets up, i start her day with formula milk. Then she plays a lot with her toys and jumps over her papa. if she wakes up at 7.00 AM or before than she falls asleep so quickly. But when she wakes up at 9.00 AM she doesn't go to bed as easily. So at 10.00 am i feed her idli or steamed dosa. I mix idli or dosa with hot water and feed her. This will keep her full for a little time. Now she can sleep with her tummy full for a hour or so. Lunch: Her lunch timing is usually 1.30 PM..I feed her a healthy hearty rice meal which has lots of veggies and spinach. You can check all my khichdi recipe here.. After having lunch, she gets back to sleep because i would have given her a warming shower before feeding..So she sleeps for few hours peacefully. Evening snacks : She wakes up at 4 PM or something like that. I would have made a warming bowl of ragi porridge or banana porridge or oats. She haves it happily. Now time to play. Early Dinner : After her snacks she sleeps someday or stay awake. At 6.30 PM i feed her some biscuits or i give her a small piece of that. Since she got her teeth and she can chew very well now. Dinner : Her Dinner time is somewhat between 7.30 PM to 8.00 PM. I always go for Idly or steamed dosa which is mixed with some hot water. 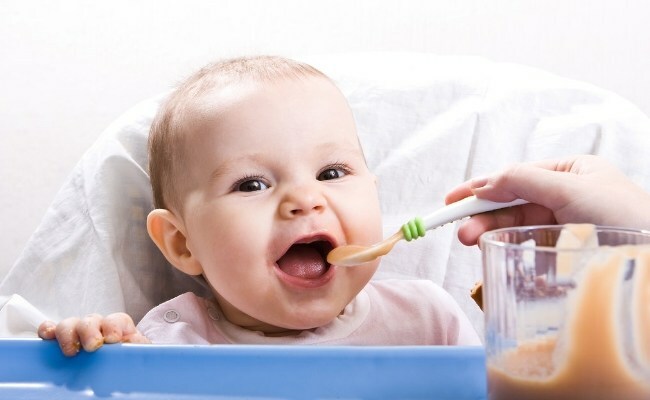 Hi Arthi,what all food and juices to give when our 9month old baby is constipated?